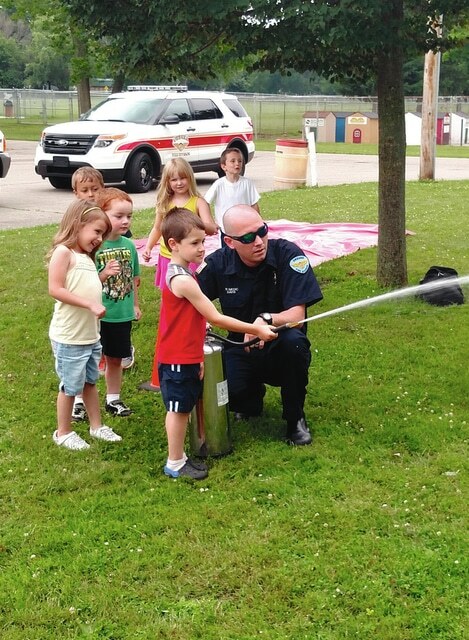 Submitted Photo Urbana firefighter/paramedic Thad Davis helped teach children about fire safety last Thursday during the Urbana Police Division’s Safety Town. The newest member of the Urbana Fire Division, Davis has worked for the department since last month. The Urbana Fire Division recently hired a firefighter/paramedic with experience from multiple local fire departments. Firefighter/paramedic Thad Davis was appointed to the position on May 26 bringing almost a decade of experience to the department. A 2007 Triad High School graduate, Davis has worked for several departments in his seven-year career including the Northeast Champaign County Fire District, Mechanicsburg Fire Department, Allen Township Fire Department and the Macochee Joint Ambulance District. Davis said the experience he gathered working for multiple departments has helped him learn how different departments operate and is helping him transition into his new position. Urbana Fire Chief Mark Keller said Davis was hired to fill a vacancy left by the resignation of firefighter Adam Puhl who took a position with the Huber Heights Fire Division. Keller said bringing in a person with Davis’ experience is beneficial because there is less training the department has to do compared to a new firefighter/paramedic. Because Davis is an EMS instructor, Keller said the department plans to utilize this skill. Davis credits his parents and wife, Abigail, for being supportive during his career and the current transition process. His father, Carl, previously volunteered for the Northeast Champaign County Fire District. “I grew up going to the firehouse and getting to be in that environment,” Davis said. Davis said growing up he knew he wanted to have a job helping people and initially pursued a career in nursing before switching to his current profession. Davis received his firefighter/EMS certificate from Columbus State in 2010. Other people Davis said who have helped him throughout his career include Allen Township Fire Chief Rod Goddard and assistant chief Steve Brose along with leadership in the Mechanicsburg Fire Department. With the hiring of Davis, Keller said the department has 21 staff members, which is down from 23 at the beginning of 2014. Previously, the department employed two additional firefighters/paramedics between 2011 and 2013 through funding from the Staffing for Adequate Fire and Emergency Response (SAFER) grant. Keller said the department applied for the grant again earlier this year.